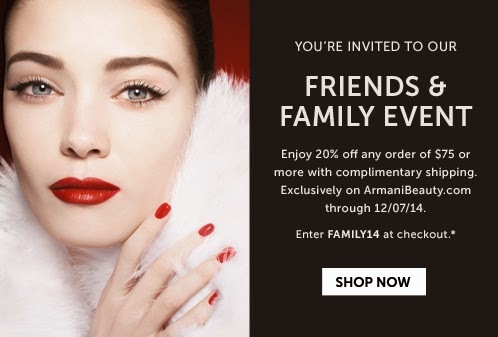 Armani Beauty Friends & Family Event is the perfect time to stock up on your favorites and do a little holiday shopping! Receive 20% off of your purchase $75.00 or more with complementary shipping! Spend over $150.00 and get 20% off plus 5 deluxe samples. Enter Code: FAMILY14 at checkout. See details here! Offer available 11/20/14 - 12/7/14. Offer not valid on egift card, Prive fragrances and prior purchases. Cannot be combined with any other offer. This is Armani US website.